A love for music and a love for each other is something that oozes out of Rose & Jake’s gorgeous wedding photos! “The wedding was held at St. Mary’s Church, Charlton Kings, Cheltenham followed by the Great Tythe Barn at Tetbury. The church was chosen because it was such a beautiful little church with a village feel, and as we had both grown up in villages in Somerset (Rose) and Dorset (Jake) but decided to get married in the place that we met in as university students, we wanted a church that felt intimate and our own. The Great Tythe Barn is stunning and has plenty of accommodation for family travelling and staying. The cottages are so cute and we had the only cottage for 2 so we got to see all family & friends the next day there too! “We also had a heart with lots of photos, and being animal lovers we had photos of past and present pets we had/have. There is also a photo of us both looking grumpy as children which is something that still makes us ( and friends! laugh at). “Something very special was having 4 photos out on the table showing all of our grandparents’ wedding photos, and as there was only one set of grandparents still with us, this made it feel very special to have them out. I did a luggage label next to each photo detailing who they were. Also, as I’m a teacher, in the church, during the signing of the register we had the infant choir singing which didn’t leave a dry eye in the congregation! “Our photographer is a family friend who also photographed my sister’s wedding last year. He is called Neil Light, and we chose him because he had done such a good job with previous weddings and not only that but we felt so comfortable with him. He is a true gentleman and it really was like having a member of the family taking the pictures, I’ve known him for 13 years! He works around you, is never intrusive and produces brilliant images! We had a ‘naked’ cake – no icing – done by Xavier at the contemporary cake designs based in Cheltenham which was 3 levels of Victoria sponge with fresh berries! On top was the Sylvanian bride and groom! Sylvanians are great sizes for wedding toppers! Entertainment was provided by a brilliant rock and roll band from Nottingham called Reverend Ribble and the Gingernuts who learnt 2 songs especially for us! They are a cool looking band who are very 1950s influenced! 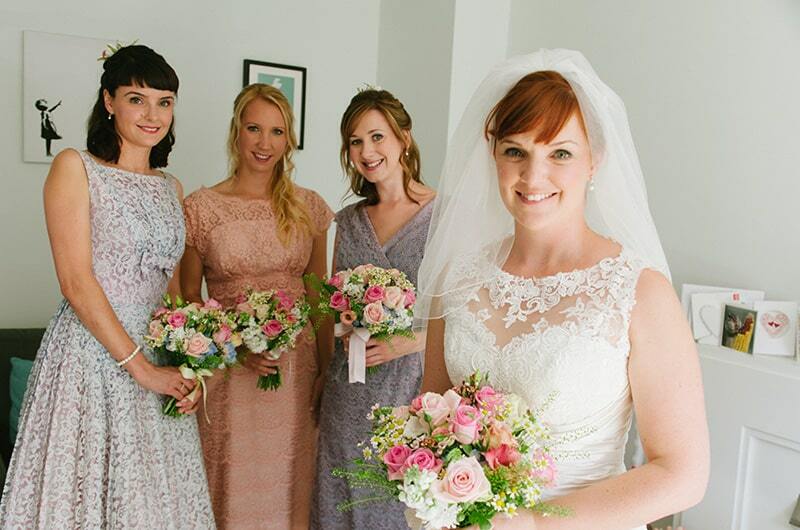 “The bridesmaid dresses were from a vintage dress collector in Bristol, called Francesca Charlton who has the most amazing stash of vintage dresses! My mum, the bridesmaids and I all went together and had a wonderful day at Francesca’s studio seeing the 3 girls trying the dresses on, until we found the perfect combination. I had my sister in blue, my best friend from childhood Natalie in pink, and my best friend from uni Anna in lilac. I am so pleased that the mismatched colours worked so well, it was a gamble as I’d only seen it on the internet, but the weather being sunny suited the colours of the flowers and dresses so beautifully. They were all from the 1960’s and only needed slight alterations by Natalie’s mum Shelley. They had pearl drop earrings, a pearl bracelet plus ivory shoes and their nails and makeup was done by the lovely Georgie Charles Bridal Makeup, a makeup artist of 23 years, she was wonderful! My dress was from By Design in Gloucester, Sarah Carter who owns the shop was such a lovely person to meet whilst trying to find ‘the one’. She was so laid back and I loved going to her shop with Mum & trying on a real range of dresses. In the end, after initially thinking I was going to have a short dress, Justin Alexander’s 8596 made me feel so feminine and curvy and once we had put the deposit down, I didn’t have a single wobble about it! My elbow length veil was also from By Design and my ivory shoes were from the Rainbow Club in John Lewis. Jake’s outfit was from Reiss and it was a French navy suit with waistcoat, with a crisp white shirt, light grey tie and brown shoes. He had a pale pink button hole and he looked so handsome! The ushers were also in navy with brown shoes, white shirts and a pale blue with white polka dots ties. We want to wish Rose & Jake all the happiness in the world and the best of luck for their future together! So niiiiiiiiiiiiiiiiiiiiiiiice!It looks like a beautiful and funny wedding,love it! Lovely! Who designed the menus? They look really interesting, from what I can see! I am afraid we weren’t given the name of the designer so are unable to help on this occasion.